Our final dinner in Maui brought us to a quiet street in Lahaina, a tourist-friendly haven on the western shore of Maui, and the aptly named Lahaina Grill. Tourist-friendly is a relative term, given Maui’s whole shtick, but Lahaina definitely flaunts that US beach town / boardwalk sensibility, with the almost unforgivable mistake of having a Bubba Gump Shrimp Co. I guess I shouldn’t knock it until I try it. The interior is dim and cozy, like a ski lodge restaurant or something equally fireplace-y. The menu at Lahaina Grill was a bit more traditional than what we saw at Mama’s Fish House, less Asian- or Islander-fusion beyond a few notable appetizers. We started with arguably the richest dish on the whole menu, a seared slab of ahi tuna topped with a decadent slice of Hudson Valley foie gras. What I found pleasantly surprising was how rich the ahi itself was, so much so that in layered bites it was hard to tell from texture where the tuna ended and the foie gras began, but the taste would slowly dissolve from one fattiness to another. Our next appetizers were the ahi poke and golden / red beet salad (with toasted dalmatia fig and goat cheese crostini). 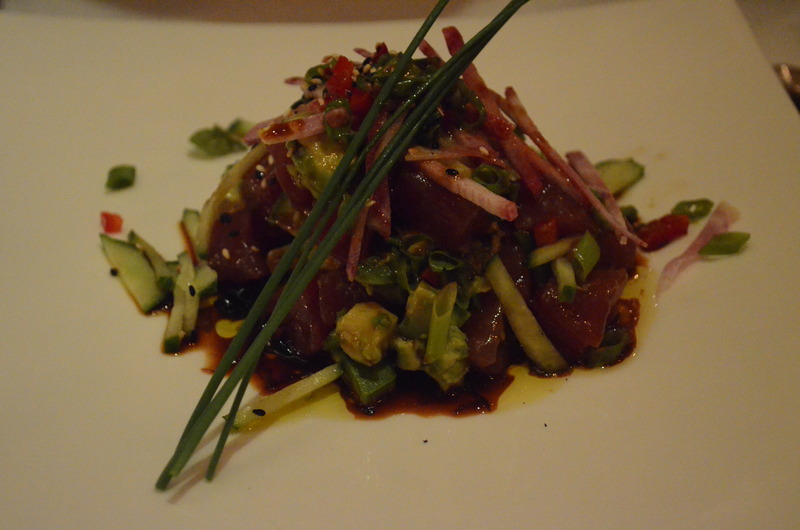 The poke was very straightforward, no gimmicks in the presentation, but with incredibly fresh ingredients (avocados, scallions, cucumbers, seaweed) and seasoning (chili oil, lime, and tamari-ginger dressing) that brought out the buttery-ness of the ahi and avocado. The beet salad, while less remarkable, was nonetheless tasty, diced small and a decent topping for a bite of the crostini. For our mains, I ordered the seafood special of the day, a generous filet of opakapaka (pink snapper) with macadamia nut crust on a bed of artichoke risotto. Myra got two appetizers as her main: the sweet kula corn soup and wagyu beef ravioli. The fish was flaky and moist, and the wagyu beef did not lose any robustness of flavor in being tucked into ravioli. The richness of our final dishes wore on us a bit, but the wagyu beef was probably my most enjoyable single bite of the evening. The roasted tomato that came atop the opakapaka was actually quite a delicious, juicy burst of sweetness when combined with a bite of macadamia-crusted fish. All in all, Lahaina Grill was my top meal of Maui (by a hair over Mama’s Fish House), if only because the consistency of execution and flavors – and let’s face it, we extended our stomachs for both meals, so the burden of cream sauces, foie gras, and risotto was less severely felt. I’d recommend every dish we got.